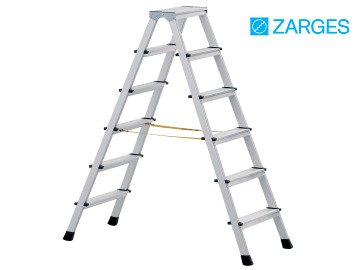 The Zarges Double Sided Stepladders have stiles with a smooth anodised finish and 80mm deep treads to allow standing without fatigue. The treads and stiles are made from extruded aluminium sections for excellent durability. 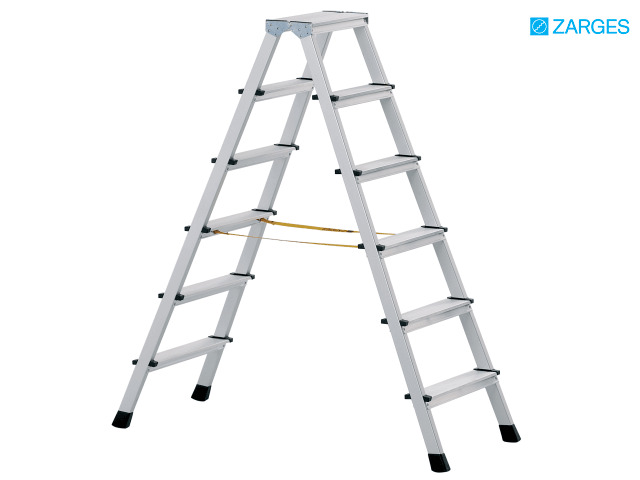 There is a triple riveted connection between treads and stiles to ensure maximum strength, and a high-strength Perlon strap with sewn-in fixing strap prevents splaying. The feet are fitted with plastic end caps to help to prevent slipping. They conform to EN 131, and have a 150 kilo rating. Number of treads: 2 x 5. Delivered Direct to Business, Site or Home, please note a carriage surcharge may apply dependant on the delivery address, please contact us for further details.